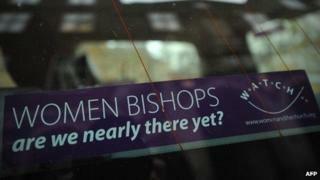 The Church of England is preparing for a debate at its ruling general synod about how to create women bishops. It is due to consider an accelerated programme for introducing women bishops and the appointment of an independent arbitrator to resolve disputes. The synod's general secretary William Fittall has warned that failure would have "very serious" consequences. Anglo-Catholic group Forward in Faith has said the new draft legislation is a "very significant improvement". The synod's failure last year to agree how women bishops should be introduced intensified divisions within the Church, says BBC religious affairs correspondent Robert Pigott. The proposals were blocked by a minority of lay members of the synod who argued that it provided insufficient exemptions for traditionalist parishes unwilling to accept oversight by women bishops. Mr Fittall described the collapse of the legislation as a "train crash" and said any repeat this week would be very serious for the Church. The latest proposals have been simplified and could lead to a final vote on the issue in July next year. As a concession to supporters of women bishops the right of traditionalists to request an alternative, male bishop would no longer be written into the law. However, there would be a powerful ombudsman-style arbitrator to provide traditionalists with an appeal process in the case of dispute. Forward in Faith, which has opposed women bishops, said: "The new draft legislation on Women in the Episcopate and the associated proposals in the Steering Committee's report represent a very significant improvement on the former draft legislation which failed in November 2012. "Though these proposals are still far from what we have long said would be ideal, we believe that they may have the potential to provide workable arrangements for the future. "They hold out the possibility of bringing to a conclusion a process that for too long has been a distraction from the Church's mission." The general synod is meeting at Church House in Westminster from Monday to Wednesday, when moves towards a law allowing women bishops will be debated and voted on. On Monday there will be a presentation by Bishop of Rochester on proposals to ordain women bishops, as well as an address by the Archbishop of Canterbury and a debate on evangelism. The Steering Committee on the legislation has said it hopes important progress can be made at this synod session, with a view to possibly getting women bishops approved in 2014. This is rather than 2015 at the earliest as had been thought. This year saw the first appointment of an Anglican woman bishop in the UK and Ireland, when Pat Storey, a Church of Ireland rector in Londonderry, was named bishop of Meath and Kildare. She is one of nearly 30 women bishops in active ministry in the worldwide Anglican communion.